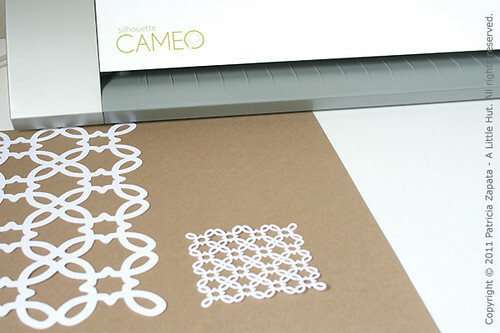 I ordered the Silhouette Cameo a few weeks ago and just had a chance to use it this week. So far I'm quite pleased with the results. 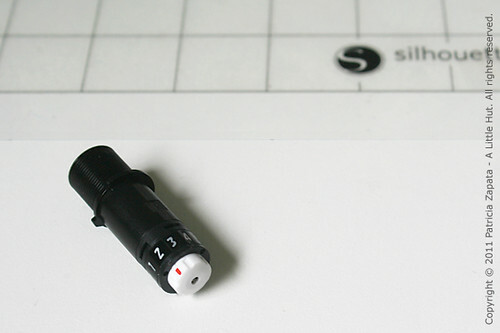 It is an electronic cutting tool that is simple to use. It hooks up to your computer and with the help of the Silhouette Studio (a free software provided by the machine maker) you can cut purchased files or make your own. 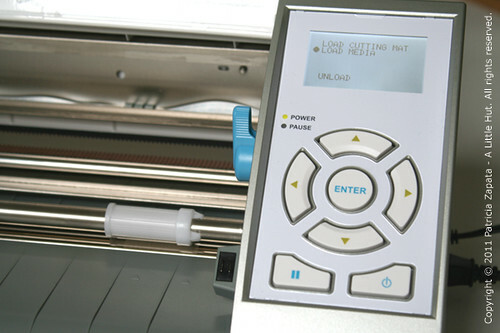 I like that the machine is clean in design (not pink or girly) and that it's fairly small (smaller than a Cricut). I tried using the instructional video to learn how to use the machine but it didn't work with my Mac. It kept skipping parts of the presentation. I used the instruction manual to fill in the gaps of information that I missed. I later discovered that I had to download the entire video on to my computer in order to see it. It never played directly from the CD but it played on my computer without problems. The blade was easy to install. With the use of the software the cutting depth and speed can be easily adjusted. I've heard that there are people having trouble with the blade but I haven't had any yet—then again I just started. The cutting mat holds up to 12" square sheet of whatever material you're cutting. So far I've only cut paper but vinyl and fabric are other materials that can be used. The width (12") is what finally made me go with the Cameo. 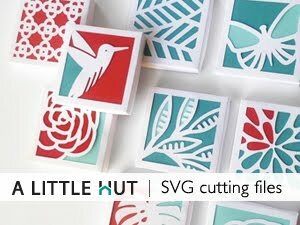 The previous SD Silhouette option only cut paper up to 8.5" wide. The cutting mat is really sticky. I had a hard time detaching larger images. I'm assuming that will not be the case after I've used the mat a couple more times. The control panel and buttons are very easy to use and understand. One particular feature that I like is the pause button. If you've cut the wrong size, the wrong color of paper or you changed your mind about anything, this button is key. 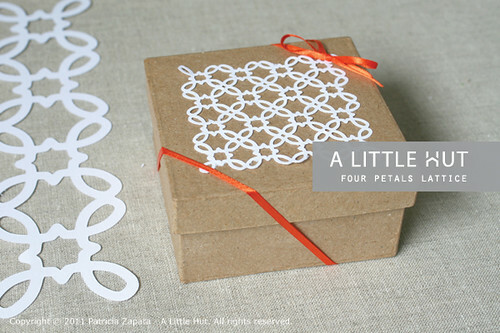 I cut my Four Petal Lattice at the 10" square size and it was difficult to remove from the mat without tearing the paper. I suppose that after a couple of uses the stickiness will be more manageable. What I really wanted to see was a smaller version of the file to see how the cutting would hold up with detail. It didn't disappoint. The shapes are crisp and the machine had no trouble at all. The bottom square is only 3" wide. - I like the way the machine looks and works. I specially like the detail work it can cut. - Good price point. I ordered my machine when it was $260-ish. - Free software to use with the machine. I like that it has an easy way to sort and label all images in a library. - As far as I've seen the replacement blades and mats aren't sold anywhere near me. That means I'll be ordering online. Not a big deal, but if I happen to need something urgently, it will be an inconvenience. - The mat is definitely too sticky but I'm sure that will change with time/use of the mat—it's not a deal breaker. - When the machine cuts it seems louder than what I'm used to—again, not a big deal. So far I'm very happy with this machine. The next thing I want to try (if I only had the time now) is the print and cut feature. That will be really interesting to see in action. I'll post my thoughts when I get to it. 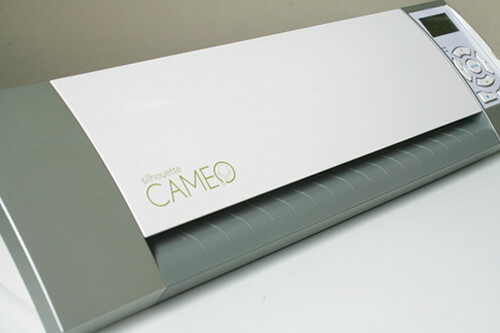 Typically the Silhouette Cameo is sold for $299 but as I said, it can be found at a lower price on occasion. The replacement blade is $19.99 and the cutting mat is $14.99. For those of you that have asked—all A Little Hut files can be cut with the Silhouette Cameo. If you have the free version of the software you can import DXF files. If you have the designer edition (additional cost involved) then SVGs can be used. This was a personal purchase. I was not sent this machine for review, nor was I asked to comment on it. Only my personal opinions are part of this post. EDIT —It's been a few days since this post. I just wanted to add a tip regarding the mat. I know I said it wasn't a deal breaker but it's getting frustrating. The mat is too sticky and the paper tears when I pull it up—and yes I'm carefully using a spatula. I rubbed a piece of fabric on and off of the mat to remove some of the stickiness and it worked. Another thing... the setting for the depth of cut is something I'm still struggling with. The machine doesn't completely cut through my Paper Source card stock. The Cricut does it with no problem. I guess it's another learning curve.